Solar bicycle consists of battery,DC-DC boost converter, Solar Panel, Motor and Motor controller.It will get its energy from three places brakes, pedals of the bicycle, and by solar-cell. a) Build an electric cycle and charge its batteries using electricity provided by solar cells at home. One time charge is sufficient for 9 Miles (15 km approx).If you use this cycle to visit nearby places; this is good option for you. b) Second method consists of placing both solar cells and batteries on the cycle. Placing solar cells on bicycle itself would help in recharging batteries while travelling. 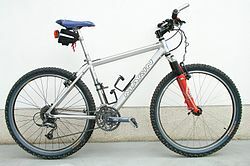 c)Third one and my most preferred one is to build hybrid cycle whose batteries not only charged by solar cell, but also use energy of regenerative braking and pedaling. 1000 Watts motor with 48V 15AH Lithium Ion Battery will be sufficient for powerful bike but 200-500 watts motor will do and solar panel size depends upon the time available to you. If you want to charge your battery quickly you can use three or more panels in series, its all depends on you.